You are here: Home › Retirement › How To Retire At 55, My Dad retired last month! How can you retire at 55? This is a question I have been asked numerous times. I figured the best people to answer this question are people who actually did it. My dad retired last month just after turning 55. My mom left her full time job about 5 years ago to relocate to where my dad’s career took him. Since then she has worked as a contractor for her former employer and is able to work part time, and mostly from home. She enjoys what she is doing and the flexibility of the job and will most likely continue for several years. My mom is partially retired and my dad is fully retired. This is a major life milestone for our family, so I asked my parents to participate in an interview to see what actions they took to retire at 55. My questions are in bold, their answers in normal text, and my additional thoughts are italicized. Bonus: This is officially the 300th article on Action Economics! 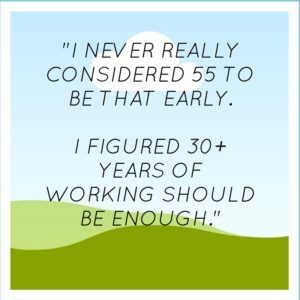 Why retire at 55? why not later or sooner? The main driver is that by working until 55 I can take 401(k) distributions from my last employer’s 401(k) plan without having to pay a 10% penalty or to deal with the SEPP / 72t rules. Without this consideration I would have retired a few years earlier. I never considered waiting any later – there are too many other things I want to do while I still can. And our finances could likely have supported retiring several years ago. I personally am OK with jumping through a few hoops for the SEPP rules. I can see if you are ready to retire at 52 or 53 waiting until 55 to not have to jump through the IRS hoops to take these withdrawals, but for someone planning on retiring at 45 or 50 the SEPP is an excellent tool. If it is set up in a way where the withdrawals you are required to take are more than what you want to spend you can just invest that money in an after tax account after taking the withdrawal. Do you remember how old your dad was when he retired? Mom how old was your mom when she retired? Dad was about this same age when he retired, but it was not a good situation. He had to retire due to serious physical disabilities caused by chemicals he worked with for many years. The older Mrs. C.’s mother began her working career at age 30 and retired at 65. She was a teacher with a defined benefit pension plan that nearly matched her final working income. I work in an industrial environment and I am extremely thankful that the culture has changed over the last 50 years to where employee safety is a much higher priority than what it historically was. I have a much lower risk of losing my life or becoming disabled than people in my grandparents generation. The U.S. department of labor estimates that roughly 14,000 workplace fatalities occurred in the U.S. in 1970. This has dropped to 5,190 in 2016, despite the U.S. workforce more than doubling in that time period. Could you give us a brief overview of work history? I did a little part time farm work as a teenager. After high school I worked several months each as a laborer at a stone quarry, a chauffeur driving kids to school, and a laborer at a landscape yard / stone retailer. I worked several months as a delivery driver then shift manager at a hot wings restaurant when I was in college. The last 2 1/2 years of college I worked as a student programmer in the university’s IT department. After college, I spent 25 years in IT at a large appliance manufacturer. I left that job 6 years ago to take another IT job at a large apparel company. I’ve had many different responsibilities in my IT jobs, but the bulk of my corporate IT work has been Unix / Linux system administration. My dad worked at the first BW3 in Columbus, OH in the early 1980s. I know that restaurant management was not his ideal career tract, but sometimes I wonder if he stayed with the company would he have ended up in upper management there. Since my dad worked there BW3 has grown from that one location to over 1,200 locations and just sold to the company that owns Arby’s for $2.9 Billion. Dad, I remember you traveled to a lot of countries when I was a kid. What was that like? How much did you have to travel overall, how long were you typically gone at a time and what was the work like? Any interesting stories from your travels? Did you get paid extra for travelling? Most of the traveling I did was in the early to mid ’90s. I was supporting the roll out of an inventory tracking system to our major manufacturing plants. Internationally I visited Mexico, Canada, Argentina, Sweden, Hong Kong (while it was still a British colony), and China. The bulk of my travel was domestic to about a dozen major plants or warehouses in Ohio, Indiana, Arkansas, Tennessee, Mississippi, Texas, and Oklahoma. These trips were usually several days of heads down IT work setting up servers in small data centers. Other business trips took me to New York, Boston, Maryland, Atlanta, Orlando, Austin, Dallas, Las Vegas, L.A., the Bay area, Seattle, and Chicago. These were typically vendor visits, seminars, or training. My average business trip was about a week for North American trips and about two weeks for overseas trips. In the few years of my heaviest travel I averaged about six trips per year. The rest of the time I averaged one or two trips per year. My employer reimbursed expenses but did not provide any extra pay for travel. A lot of people like to do culinary adventuring when traveling on expense reports. Not me – I generally wanted to get quick, healthy, and familiar foods so I could concentrate on my work and exploring the surrounding area on foot. I would often arrive a few days early or stay a few days late and take vacation days to hike. A few times your mother was able to take a few vacation days and fly to meet me there (mostly after you left home). My travel time was hard for your mother because she had to work full time and manage the household and kids on her own. Mom, you took class at night to earn your bachelor’s degree while working full time. It seemed like you were going to school forever at times. Overall did earning your bachelor’s degree pay off? I earned my associate degree in 1991. I soon started working full-time and took evening classes – generally one class at a time. It took 15 years to earn the bachelor’s degree – so yeah – basically forever. It did pay off in terms of career advancement, but it also took a toll on family life. My mom called this the “One Class A Semester For The Rest Of My Life Plan.” It takes a lot of determination to set such a long term goal and stick with it for that long, especially while working full time and raising 2 kids. Did Defined benefits retirement plans (pensions) play a large role in hitting retirement? If I remember correctly both your primary employers “froze” defined benefits plans during your careers. I had a defined benefit plan that was frozen after 20 years of service. I will take this plan as a lump sump distribution (into an IRA) in the next few months. Your mother had a defined benefit plan that her employer converted to a “cash balance” plan after about 10 years of service. The proceeds of these two plans will make up about 18% of our total portfolio – so they represent a non-trivial amount but are dwarfed by our defined contribution plans and other savings. Defined benefits plans are largely a thing of the past. So many that still exist today are extremely underfunded. I highly recommend that any young people who are enticed by such a plan at a potential employer pretend that that money doesn’t exist and save for retirement on your own. There are already many horror stories of what happens when these plans go bust. You retired at 55, which is quite impressive, When did you start saving for retirement? In 1991 when your mother took a job at the local nuclear power plant. In 1991 My parents were in their late 20s and their youngest child (me) had just started full time school. In 1991 the employee 401K maximum contribution was $8,475, compared to the $18,500 limit it currently is. What milestones felt the most important on your financial journey? Income based, net worth based, savings rates? homes, vehicles? Was there a point where you finally felt “caught up”, where you didn’t have to worry about money much? Earning a full ride college scholarship in high school opened a great opportunity. Completing my bachelors degree and landing a real corporate job put us on the path to serious earning power. When your mother started a corporate job in 1991 it had a 401(k) with a company match, and the second income made us really feel like we could start saving (which we did, in both employers’ 401(k)s. After a few years of allocating most of our raises to our 401(k)s we both began hitting the IRS allowed maximum 401(k) contributions every year. How has your investing strategy evolved over time? In the early years pretty much 100% of our savings and investing were stock mutual funds in tax deferred 401(k)s. At that time we did not keep much of an emergency fund – we figured we could survive on one income if we had to. In the past decade or so we have aggressively added cash savings so we would have a few years’ worth of expenses outside our retirement accounts. This is so much different that how myself and Mrs. C. operate. For the past 5 years we have maintained an emergency fund of roughly 6 months worth of expenses. Our risks are different though, Mrs. C. works a part time retail job and I work season jobs with highly variable income. Have you participated in Employee stock purchase programs? Roughly what’s the highest percent of net worth that you’ve held in an employer’s stock? We have participated in an ESPP and held employer stock in 401(k)s. I don’t remember the precise peak percentage of our net worth in employer stock but I’m sure it was less than 5%. For some reason I always assumed this was MUCH higher, like 25% plus. Perhaps that is because when I first started paying attention to money we had the WorldCom and Enron scandals and the 24 hour news cycle was constantly airing horror stories of people who had their entire 401(k)s invested in their employers stock. Most likely this was a very small percentage of the people who worked there. WorldCom and Enron were perfect examples of why you should never have all your eggs in one basket. When the market crashed in 2008 and most stock portfolios fell by over 50%, and your company stock fell by over 80%, what actions did you take? Our retirement accounts were already 100% allocated to stock funds and we kept it that way. We also kept all our new contributions going 100% into stock funds – stocks were on sale then! We never considered selling in a down market. Some people bailed out because they “couldn’t afford to lose any more”. My attitude is if broad based stock funds go to zero, it will be because of a complete economic collapse and the dollars you would have gotten by selling would be worthless anyway. My advice is to never panic sell in a bear market – unless you really need the money right now in order to eat (in which case you shouldn’t be 100% in stocks to begin with). This is an important thing for your readers to take very seriously – we are 9 years into a huge bull market with interest rates still near historic lows. It is not a question of if there will be large and rapid market drops, but when. If you have any doubts about your resolve to avoid panic selling in a market downturn, you should sell some now while stocks are near an all-time high. I didn’t start heavily investing until 2013. Before that Myself and Mrs. C. had well under $10,000 in invested assets. Essentially the U.S. has been in a bull market my entire investing life. I don’t plan to adjust asset allocation or contributions when we hit a down market. It will be interesting to see what happens. How did your savings rates change over time? I remember many years ago talking about how amazing it was that investing early could result in having exponentially more money later on, that $1,000 now could be $5,000 in my 50s. You told me that while that is true, it is WAY easier to save $5,000 at 50 than it is to save $1,000 at 20. In our earliest years we managed to pay our bills but weren’t really saving any money (however we were investing our meager funds and life energy in furthering our educations). When you mother took her 1st corporate job (so both of us were then working full time corporate jobs), we began saving around 5%. Over a few years, we ramped up to a savings rate in the low thirties. And indeed, it is much easier to save 30% of a “high” income than 5% of a “low” income – even though the effective tax rate is much higher. Mrs. C. and I have hit the high 40s for savings rate for the last couple years. Although I have a stretch goal to hit 50%, I don’t think it is highly likely to happen until we pay off our house. Consistently challenging your savings rate and increasing it over time is extremely important to building wealth. Take the Quarterly Savings Rate Challenge! What did it require to get to this point? What major sacrifices/tradeoffs have you made to reach this goal? My college years were brutal – we were both working, and I was in an Engineering / Computer Science program full time while raising first one, then two kids. We would literally have no days off (even weekends or holidays) for months on end. During the growth phase of our careers both our jobs were extremely demanding of time and life energy. Our earnings were growing rapidly but the pressure had negative impacts on our children, our marriage, and our health. Also, throughout our corporate careers we lived 400 miles away from any relatives who could help with child care, etc. – so we were on our own in that regard. As far as lifestyle, we have spent the past 25 years living well beneath our means. I know you have quite the impressive library, what books have you read that had the most impact on your financial journey? I thought this would be an easy answer, but looking through my library I find that I don’t have a single personal finance book I can recommend without reservation. I think you should write one! No pressure right? Writing a book would be a massive undertaking. I have thought about writing either a generic personal finance book or a task specific book such as building generational wealth or achieving early retirement. What are your thoughts? I think we are still a few years out from me writing a book. I have a hard enough time publishing 1 article a week for this site. Although it is a bit dated I love “The Millionaire Next Door “, which does a great job of showing that it is possible for median earners to become extremely wealthy through consistent savings. What withdrawal rate are you planning on using? Will the rate change over time? I plan to use 4% as an upper guideline for our consumption – not 4% of our portfolio at retirement increased by inflation each year, but 4% of the then current balance. This should protect us if we have several years of negative returns (we will adjust our lifestyle if necessary). It will also allow us to increase our spending if prosperous times allow it. A 4% consumption rate based on our current portfolio would allow us to increase spending in retirement a bit over what we have been spending in recent years. We do expect our spending in retirement to be higher than our recent spending due to our extensive travel plans. We will likely start with a significantly lower withdrawal rate since your mother is still earning about what we spend each year. There may eventually be occasions where we go well above 4% to fund a house purchase, etc. The above comments refer to our planned actual consumption. We have a mix of taxable and tax deferred accounts. We will plan our distributions from tax deferred accounts to minimize lifetime tax liabilities (by filling up low rate brackets, etc.). So in any given year, our official taxable withdrawals may be significantly higher or lower than our consumption. I wrote about a similar strategy in my article Comparing Retirement Withdrawal Strategies. This is very similar to the mechanism that Warren Buffet set up for his donations to the Bill and Melinda Gates foundation. He set aside a fixed number of shares (i.e. your retirement nest egg) and then donates 5% of the remaining share balance every year. Even though he has given away billions of dollars a year for over a decade his yearly donation has grow from $1.6 Billion in 2006 to $3.17 Billion in 2017. I love the concept of taking a percent of the remaining balance and adjusting your lifestyle accordingly. When do you plan to take Social Security? I have not really analyzed this yet. My current assumption is we will wait until age 70. Our planning over the years was always based on the assumption that Social Security is very unlikely to pay out 100% of promised benefits over our lifetimes – particularly for higher earners. Your Action Economics article “How To Find Out Your Social Security Benefits” gave me a better understanding of the mechanics of how benefits are calculated. Waiting until 70 is usually the best way to go if you think you will live to be 79 or older. A lot of people like to “take the money and run”, but they are leaving a LOT of money on the table, money that is relatively “low risk”. If you already have a large nest egg investing in delayed Social Security benefits is an excellent strategy. Benefits grow by 8% per year until age 70, and then your Cost of Living adjustments are based on a higher dollar amount as well. Do you feel confident that you have enough resources to support your early retirement? By all normal assumptions we have more than adequate resources. However, I worry about the possibility of catastrophic events like hyperinflation or an EMP event. Also, psychologically your mother and I still sometimes feel like a couple of scared Appalachian kids up against the world, so we’re never 100% confident. That being said, we have thrived in a variety of economic circumstances in the past. So far we have never missed a meal and I think we will do pretty well going forward. Any financial regrets, should have/would have/could have? We’ve changed houses several times and lost money on nearly every real estate transaction we’ve made. I was a huge fan and customer of Amazon from day one, but thought their IPO was way overpriced. If I’d sunk a few thousand dollars into Amazon stock it would have paid off handsomely. That being said – their stock still seems overpriced – so we still don’t own any. Although my parents lost money on every house transaction, the houses they lived in were far below their means. I think 3 of the 4 homes we lived in in Michigan cost less than 1 years income for my parents. This greatly deadened the blow of taking losses on sales and carrying dual carrying costs on properties. $1,000 invested in Amazon in 1997 would be worth around $800,000 today. I generally recommend investing in index funds, however I think it is OK to invest between 5 and 10% of your savings into high risk individual stocks. I currently have 20% of my portfolio invested in Tesla stock. This is a large percentage because it has grown heavily over the last 2 years. I am not adding any new money to it at this time. What is the biggest financial setback you can remember? In 2011 I got a boss from hell that I absolutely could not live with and decided to leave my job. Over the years, my duties had grown ever more esoteric and specific to just my employer. So when I decided to move on in a hurry I ended up taking about a 30% pay cut. It was also late in the year and I ended up walking away from that year’s bonus. My new job was several hundred miles away, so we had to sell our very nice house and acreage in a depressed Michigan property market. We got about $75K less than what we had paid for it 8 years earlier. At the time, your mother was earning very good (and increasing) money. Because of the great distance to my new location she also had to leave her job. She ended up not working for six months, then has worked part time since then. In total, this event negatively impacted our finances by several hundred thousand dollars. However, we quickly adjusted our lifestyle and financial arrangements -and our savings rate (in percentage, not dollar terms) – has rebounded to about the same as it was before leaving my previous job. There has been a silver lining though. After the initial move our new life has been much less stressful than before. We also discovered, that even in our late forties we were resilient enough to adapt and thrive in new circumstances. And while our portfolio is not as big as it would have been, we think we still have “enough”. 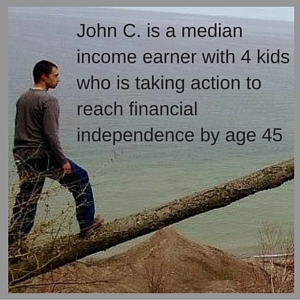 This is what financial independence is all about, being able to take a serious financial hit if it means living the life you want and not compromising for a negative overall life situation. We lived in a trailer park from when I was a baby until I was six. My earliest memories are from living there. Back then did you think it would be possible that 30 years in the future you would be financially secure and able to retire a decade before most people? Our attitude was always, we just need a chance and we can make it work. By the time we bought our trailer in 1987 I had a bachelors degree and a corporate job. So in our minds we were well on track even though we had no savings and no financial plan. We would fill in the details later. And we did. I never really considered 55 to be that early. I figured 30+ years of working should be enough. I think along the same lines, but most Americans apparently don’t. Less than 2% of Americans think they will retire before 55 and less than 30% think they will retire before 65. The way I see it is if you can’t save up enough money in 37 years, then another 10 years might not make that much of a difference. I think these numbers are based on people who see Social Security as their primary source of income in retirement, scary! When I’ve had conversations with people in the past about early retirement a lot of people in your age group have remarked that they would be bored and would have no idea how to spend their time. Do you think that will be a problem for you? What plans do you have for keeping yourself occupied? We have ZERO concern that this will be a problem for us. Last summer we bought a motorhome. Our main retirement project is to live and travel full time across North America in our RV. We love to hike (especially in the mountains and deserts). We have friends and family (including five grandchildren) scattered over a dozen states. We also like rock scrambling and bicycling. We like visiting historical sites and battlefields, mines, tramways, museums, etc. We will plan our schedules and travels to maximize opportunities to see natural phenomena such as meteor showers, eclipses, glaciers, hot springs, canyons, rainbows, moonbows, etc. There are thousands of things to learn about – astronomy, woodworking, drones, photography, metal detectors, etc. Additionally, we will both be doing some part time work from the road. Because of how my parents developed their careers they have put themselves in the position to become digital nomads. They both can work very part time hours and ramp up if needed, from anywhere in the world with an internet connection. For the most part they should be able to cover the majority of their expenses during this first phase of retirement allowing their nest egg to continue to grow into “too big to fail” territory. I think everyone should adopt a “super long term” view of their career ark and build opportunities for part time, flexible, and hopefully high paying work. What are your current vehicles? Your mother has a 2004 Honda Civic with 326,000 miles. I have a 2010 Subaru Forester with 152,000 miles. As you are aware, many people sink a lot of money in vehicles that rapidly decrease in value. We try to avoid that. However, we will probably splurge more in this area when we are living full time on the road and spending a lot of time in our car. Drive simply my friends. It absolutely KILLS me when I see the young guys I work with buying brand new trucks after getting a couple paychecks. I’ve seen guys who earn on average $400 a week go out and buy $35,000 trucks. This is economic suicide at its worst. Any advice money, life, whatever for me and my readers? Set up regular automated contributions to as many savings vehicles as you can (401(k)s, IRAs, savings and brokerage accounts, etc.) – even if it’s only a dollar in each. Then each time you get a raise, use at least half of it to increase those automated transfers. Invest in your own earning power through education, experience, and hustle. The easiest way to save more is to earn more and not spend it all. Your life will be much happier if you take ownership and realize that *you* are the person most responsible and able to improve your life. Your health is even more important than your wealth. Focus on creating a healthy lifestyle. Find a good life partner and build a life together. It’s much easier as a team. Children are your permanent legacy and will enrich your life. Since the birth of capitalism people have been getting richer and freer all the time – and it is still happening every day. Don’t let naysayers convince you otherwise. There you have, a blueprint for how it is possible to get ahead and retire early, even if you have kids young, aren’t born into a rich family, make some bad decisions along the way, and don’t “hit it big” with an amazing stock, like Amazon. It’s super cool that my parents were able to do this, and to build a good foundation of financial literacy for me and my sister. Any questions for my parents or for me? 10 Responses to "How To Retire At 55, My Dad retired last month!" Great post. one question: what about the health insurance if you retire at 55? Medicare is 10 years away, ACA is not a sure thing in the future. For the remainder of 2018 I am continuing our high deductible employer plan using COBRA. Those premiums are about $800 / month. For 2019 we will investigate whether we can get coverage through Mama C’s employer. If that fails, it looks like we can get a high deductible ACA plan for about $1300 / month, and I think there are some non – ACA compliant options as well. In our retirement planning we have assumed our insurance premiums could be around $2000 / month until age 65. This is definitely one of the biggest financial challenges and uncertainty of retiring “early”. We have enough assets to cover all but the most catastrophic medical events even if we had no insurance. However one thing that is frustrating to me is the pervasive practice in the medical community of billing phoney inflated “list” prices that routinely get “adjusted” downward by 75% – 80% by the insurance companies. So basically if you are paying out of your own pocket they are billing you 4x or 5x what the insurance company pays. Most of the value you get from medical insurance seems to come from these “adjustments” rather than from actual payments made by the insurer. In an ideal world, insurance plans would be sold across state lines, medical providers would be required to be transparent and nondiscriminatory about pricing, employer based and individual market plans would be treated the same for tax purposes, and you would have the option to buy “super-catastrophic” plans with $25K deductibles and low premiums. In the real world we have a kludgey mess of opaque and discriminatory pricing, unequal tax treatment of employer based vs. individual market policies, constantly changing government rules, and high medical inflation. Not to mention a medical community that thinks it job is to manage disease instead of to promote health. Does anybody out there have a good plan for health care for early retirees? I have worked for two different hospitals. I know it is an alien concept but you can bargain for your medical care. Many times hospitals will accept 50% on the dollar if you pay up front. Depending on how good you are at haggling you may even be able to get a lower price. I believe some doctors offices are also willing to bargain. Why pay full freight if the insurance companies don’t. Just be sure you are speaking with the correct person. I was fortunate in that my previous employer allowed me to keep my insurance after I retired five years ago. The cost is $693 per month for single coverage. My previous employer doesn’t cover any of the costs but it is a group policy with good coverage. When I am old enough for medicare, the policy will convert to a medicare supplement. If you read Root of Good’s blog, his family benefits from ACA coverage and he keeps his income low in order to qualify for subsidies as the program does not look at assets. There are also concierge programs by doctors here in Florida that provide medical care for a set price each month. You might be able to find similar services. Good luck and congratulations on your retirement. Thanks for the info on negotiating with hospitals and doctors. Do you know how someone not familiar with the medical industry can figure out who to talk to to negotiate prices? I like the concierge care concept you mentioned. Mama C and I plan to look into that. Right now we are in Kentucky, but eventually will likely move our domicile to a state with zero or low state income tax like Texas or Florida. My job title was Discharge Financial Counselor. You can ask for the business office supervisor as well. In Doctor’s offices, ask to speak to the office manager, she/he will have the greatest latitude in negotiating payments. Great post! It sounds like your parents have a really solid plan and have had good financial habits for a long time. Now I see where your interest comes from! As a fellow Michigander, I have often wondered if there is a relatively high interest in early retirement given the relatively high prevalence of union jobs and defined benefit plans with options like “30 and out” or “age + seniority.” While that would put plenty of people in the population with time and health to enjoy early retirement, the pension system would not have required that they do that through good habits. So, I have also wondered if those examples are net good or bad, as examples. Since you asked about books, I also like The Millionaire Next Door; I think its contribution is to describe an alternative to strive for, rather than equating wealth with consumption, which is the media/sports/entertainment model. In terms of my favorite finance book: I am the oldest of 4 brothers, so I do occasionally try and pass on advice. My first attempt at a personal finance book for them was “The Barefoot Investor” by Scott Pape. Since 2 of them were just finishing college then, I thought they might be in a phase of thinking about where they wanted to go with their lives. After reading it, my youngest brother’s feedback was: “Yeah, but it doesn’t tell you what to do!” Taking that queue to be more practical, I found “Your Money Ratios” by by Charles Farrell. This is a Financial Planner-in-a-box. While the limits of any book mean it’s targeted to median wage earners, anyone can learn a lot from it. In fact, the book covers so much that I find everyone I recommend it to loves it, but for entirely different reasons! (it even covers how to value a pension when counting your savings goals) I keep a stack to give out to people who approach me with fundamental finance questions, in addition to regularly making it a graduation / wedding gift. I also find that the broad appeal helps serve as a launching pad for further study: by covering so much, people find their specific interest or pain area and are better able to ask questions and do more research. I can’t recommend it highly enough. The union jobs with pensions could be a reason for higher than average early FI people in Michigan. For me the fact that these types of pension plans are getting much more scarce and are often underfunded provided me with a lot of motivation to do it myself. I will have to check out that book, it sounds like a winner. Thanks Matt! I was not familiar with either of the books you mentioned, so I checked them out on Amazon. Charles Farrell’s quote: “All decisions you make should help move you from being a laborer to being a capitalist” (from “Your Money Ratios”) really hits the nail on the head! I read that blurb then immediately bought the Kindle edition. I added The Barefoot Investor” to a list to evaluate later. I know you’re too busy at this time to put the life energy into writing a book. If one day you decide to, you have already created a lot of content on Action Econ that could be the basis for parts of the book. I even think you have already created the perfect title and subtitle: “Action Economics – Take Immediate Action to Improve Your Finances”. Your recent post “The Ten Minute Guide To Personal Finance” could provide a chapter outline. I think a 90 day plan of specific discrete actions you can prescribe for a reader to get on the path towards financial independence would be very helpful. Beautiful post. What a great way to honor your parents and impart their wisdom to your readers. This is my favorite Action Econ article. Thank you for sharing this, John C (and Mama & Papa C).